New photographic evidence has emerged of "significant" Chinese military defences on artificial islands in the South China Sea, a think tank reports. China had previously committed to not militarising its controversial developments in the region. But satellite images published by a US group appear to show anti-aircraft guns and missile defence systems on the seven islands. Several countries claim territorial rights in the South China Sea. 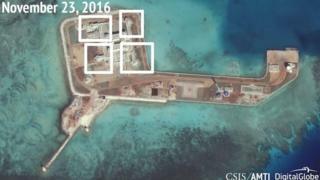 In a report on Wednesday, the Asia Maritime Transparency Initiative (AMTI) said it had been tracking construction of hexagon-shaped buildings on four of the Spratly islands for several months. It said the new buildings were an "evolution" of structures on the three other islands, but it was now confident that all of the buildings housed military defences. The group says that some buildings "host what are most likely anti-aircraft guns" which have visible gun barrels in satellite images, while others are probably what it terms close-in weapons systems (CIWS). CIWS are defence platforms used to detect and shoot down missiles and other aircraft. Some of the structures have been buried, the group said - which would make them less vulnerable to enemy strikes. "These gun and probable CIWS emplacements show that Beijing is serious about defence of its artificial islands in case of an armed contingency in the South China Sea," AMTI said. "Among other things, they would be the last line of defence against cruise missiles launched by the United States or others against these soon-to-be-operational air bases," it added, in a reference to previous photos which seemed to show aircraft hangars being built. China's Defence Ministry said on Thursday that its deployment of military equipment was "legitimate and lawful". A brief post on the Defence Ministry's microblog site described the equipment as necessary and defensive. During his state visit to the US in September 2015, Chinese leader Xi Jinping said China did not intend to pursue militarisation of the Spratly islands but emphasised China's sovereignty over the region. The contested region holds crucial shipping lanes - which prompted the United States to send a warship into the area in October. The White House said it was to "demonstrate ... lawful uses of the sea that the United States and all states are entitled to exercise under international law." China accused the US of an illegal act, and of being "intentionally provocative". China claims almost all of the South China Sea, including reefs and islands also claimed by other nations, and has caused dismay in the region by building artificial islands and restricting access. But Vietnam, the Philippines, Taiwan, Malaysia and Brunei all have competing claims. In July, an international tribunal ruled against Chinese claims to rights in the South China Sea, backing a case brought by the Philippines. China, however, called the ruling "ill-founded" and says it will not be bound by it.